You can use any contactor / relay you want, but we have always had very good luck with these, which is why they are the type we carry. They are designed to handle 30 amps at 120VAC or 240VAC. Note that there are several versions of this relay with coil voltages at 24VAC, 120VAC and 240VAC. The wiring diagram is basically the same for all of them, but you have to make sure you supply the right voltage type for the coil you are using. Above is the standard wiring method. There are some advantages and disadvantages with this wiring method. If you need to have a HOT wire when the unit is off (unlikely), then this will be the method you use. This is called the "normally off" setting, and it will only carry 3 amps when the unit is off, but on the other leg, 30 amps (at 120v or 240v) when the unit is off. This can be handy, but it means you have legs that are always hot and are a shock concern if you touch the unit when it is off. This is the wiring we used for tanning beds and our own UV curing rigs. You are moving the power in and removing the ability to have a "normally off" power setting, but that also removes the shock hazard. This will carry 30 amps, and is the wiring diagram that most of you will use. There are a few different voltages of relays, 24V, 120V and 240VAC. This relates only to the COIL itself, not what the relay will handle. All of them can handle up to 28VDC, or as high as 380VAC, with the amp load capability depending on the voltage and type, AC or DC. For most of you, all this doesn't really matter as you will be using it for 120VAC or perhaps 240VAC. When configuring the 0 and 1 poles, polarity doesn't matter. For 120V operation (most common), just connect a neutral wire to either 0 or 1, then you should have some kind of a switch that sends a hot line to the other pole. A standard home grade light switch is perfect for this, mounted in a standard box. They have two poles, in and out. You just connect the incoming power to one pole, and run a wire from the other pole to this relay coil. That way, when the switch is on, you are sending power to the relay, causing it to turn on. You don't need heavy gauge wire for this, as the coil only uses milliamps of current. Technically, this is two relays in one. You have two different sizes and can switch completely different loads. 2/3/4 is in no way connected to 6/7/8. You may find you only use one set, or you can jump the incoming power across to the other side, and have two hot poles when the unit is on. It is up to you. As for durability, we have used these as the main switch for tanning beds for years, including 30x100w lamps on choke style systems (hard load) and for 32x100w electronic systems. These are way heavier loads than you will ever use. The failure rate is almost non-existent. When they turn ON, you should hear a very audible "click" sound. For those of you that are curious, I did can a Dremel and cutting wheel and open one up some time ago, so I could take pictures. It probably won't help building your UV curing rig, but might quench the curiosity of my fellow nerdy types, or at least help you understand what is going on inside. 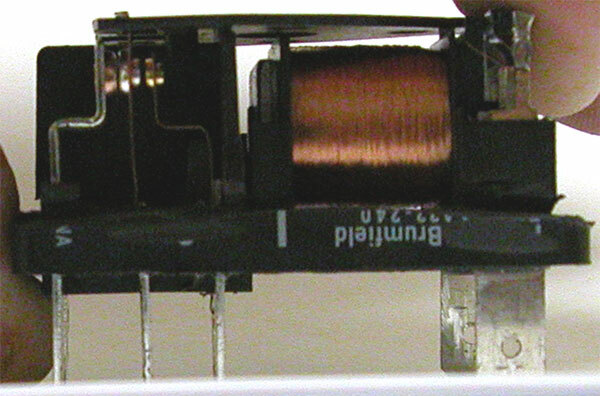 The coils of wire are from the "coil" and act as an electromagnet, moving the parts inside.